This Kichler Clearpoint outdoor wall light in brushed aluminium and rated IP44, with porthole stye and wire mesh reinforced glass lens features contemporary nautical style. Boasting a circular body and riveted fascia, with lower hinged window fitted with wire reinforced clear rippled glass. The hinged door looks like a porthole window, facilitates easy lamp bulb changing and is secured using a knurled thumb screw. This outdoor wall lantern design showcases a nautical look that brings a distinctive look to your outside appeal. This fixture features wired glass and beautiful brushed aluminium finish, which creates aesthetic marine atmosphere. If you are searching for quality outdoor lighting in classic nautical style, the Clear Point exterior lantern should be considered. Fully weatherproof and supplied with a manufacturer’s 3-year anti corrosion warranty, which relates to the corrosion of finishes on aluminium lights like this one. Locations within 5 miles of the coast are excluded. 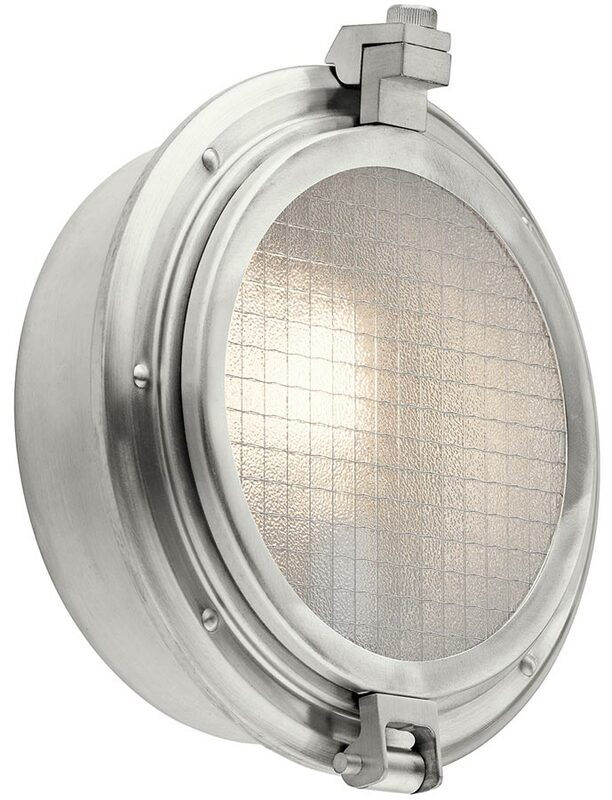 This exterior light is supplied by Elstead Lighting and designed in the USA by Kichler who were founded in 1938. They design beautiful home lighting products featuring award-winning craftsmanship and unparalleled quality, such as the Clearpoint outdoor wall light in brushed aluminium and rated IP44 you see here.